Riesling by Crabtree of Clare Valley. A punchy, layered grapefruit and citrus spice palate coats the mouth, finishing long, crisp and dry. Valley Clare is internationally renowned for Riesling, many of the region's finest vineyards are at Watervale. There is a conjunction of unique and distinctive soils at Watervale, loam on limestone or loam on shale, all well-draining and enhanced by a favourable climate, warmth, sunshine and cool nights. A splendid rendering of luscious Watervale Riesling. The Crabtree site has been planted to vineyards for well over 100 years, with the first vines being planted in the 1880s, though none of these original plantings exist. Adolf Glaetzer and his sons were largely responsible for the planting of the vineyards as they are today, with the remainder being largely Robert Crabtree’s more recent plantings of Shiraz, Cabernet Sauvignon, Tempranillo, and a little more Riesling. Although the original plantings have long since gone, most of the current vineyards are still quite mature, including 60+ year old Grenache, 50+ year old Shiraz, and 30+ year old Riesling vines. The winery is quite small overall, and is very much a boutique operation so far as production is concerned. The greater part of the production, as for many of the Clare Valley wineries, revolves around Riesling, with this variety accounting for approximately 50% of overall production. Second in production volume is Shiraz, and then Cabernet Sauvignon, with smaller amounts of Tempranillo, Grenache, and Semillon. Traditional rod and spur hand pruning is used on all vineyards, and all grapes are handpicked. All fruit is estate grown for the dry white and dry red wines, with a very small percentage of high quality Muscat grapes from the Smith family in the North of Clare (from 140 year old vines) added to complement the estate's own Muscat of Alexandria supply to make sweeter Muscat and Zibibbo wines. Vines are very low yielding and are essentially dry grown, although most of the vineyards do have drip irrigation lines to ensure the vines do not suffer from too much water stress. The house that makes up the cellar door dates back to when the Clare Valley was first settled, and has been the home of a number of local identities over the years. Robert Crabtree resided here while making wine on the estate. Adolf Glaetzer was one of these residents, known best in the Clare Valley for his fresh fruit and vegetables rather than winemaking, though his descendants have made the Glaetzer name synonymous with Australian winemaking. Robert Crabtree purchased the house from the Glaetzer family, it is heritage listed, the oldest sections date back to 1849. The estate is home to a family of very inquisitive alpacas, which apart from being pets, also keep the grass at bay around the winery. José, the older male Alpaca, has the handy habit of being very protective of his family of females and keeps the sheep safe. The alpacas and sheep love nothing more than eating freshly crushed grape skins and stems during vintage, and will crowd around the winery when they see grapes on the tractor hoping to get a feed, which they usually do. Free roaming geese, an increasing number of ducks, chickens, cats, and some lorikeets, all of which can be seen wandering around the house (except for the Lorikeets of course), and some of which occasionally join in the cellar door for visitors wine tasting. Sales of alpaca wool or chicken and duck eggs through the cellar door go directly to improving education at a school in Africa that the winery sponsors. 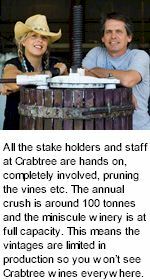 All the stake holders and staff at Crabtree Watervale Wines are hands on, completely involved in the winemaking process and pruning the vines etc. The annual crush is around 100 tonnes of grapes per year, and will remain around that amount as there are no intentions to make larger volumes. The miniscule winery is at full capacity most vintages as it is. This means many of the wines are very limited in production, and is the reason why you won’t see Crabtree wines everywhere.